THE paper trail connecting the climate change sceptic movement in Australia and the conservative US expert panel the Heartland Institute goes back at least to 2009, documents released on the internet this week show. The Heartland Institute, a leading group that funds activities designed to sow doubt about climate change science, was embarrassed this week when its strategy and budget documents found their way to a US blog. Documents from the Australian Securities and Investments Commission show that a group funded by the Heartland Institute, via a thicket of other foundations and think tanks, provided the vast majority of the cash for an anti-carbon price lobby group in Australia in 2009 and 2010. The sums are trivial, around $50 or $60,000, and the fact that Ben Cubby gets so steamed up about them when Greenpeace and WWF have budgets in the hundreds of millions reveals the desperate desire of the alarmists to smear the sceptics. 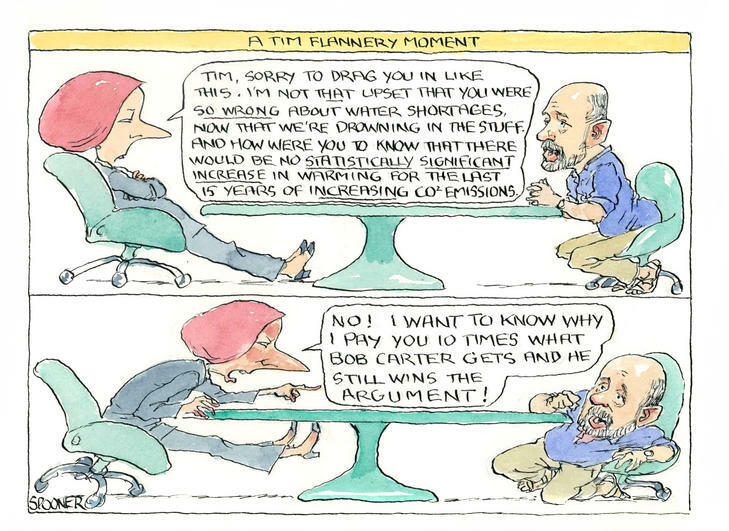 Why aren’t the motives of Big Green ever discussed at Fairfax? Because they have the politically correct moral high ground, perhaps? Cubby also hints that the opinions of the scientists advising the ACSC were influenced by the funding, an allegation that Bob Carter regarded as “offensive”. Presumably, since Cubby cannot comprehend why anyone could possibly hold views contrary to his own, it must be down to financial incentives. More importantly, Heartland stated on their press release that a key document in the bundle was faked, a fact which Cubby also fails to mention. Typical Fairfax spin, as usual. But I’m very glad the cartoonist hit the nail squarely on the head. All this nonsense about skeptics sources of income is a classic example of “swallowing a camel and straining at a gnat”. At the institution concerned, Bob (like me) is regarded as a heretic, but we both have allies. because it’s known that (unlike some of the others) I’m not full of ***. month into about $1 an hour – not exactly big bikkies. LOVE IT !! Yeh, Tim, where’s the perpetual drought you promised us for your $180,000 pa worth of utter nonsense ? Of course you won’t find any mention of ‘faked’ documents from Ben Cubby as that would raise the question – why would you need to fake documents against a sceptic, when the warmist cause is right and just? On the issue of ‘stolen’ documents, you won’t find much from Cubby either, simply describing the stolen Heartland documents as “finding their way to a US blog.” Perhaps because Ben isn’t phased in using stolen material to read private briefings, as this Twatter reveals, which leads to this confidential climate change briefing.